Address: 139 Lavender Street, 338739, Singapore. The hotel’s coffee house often do promotion for set lunch and this visit, it was a buy 4 free 1 offer. And, it has been a while we did not visit this restaurant for lunch. Their menu changed for this visit. They used to serve the coffee and tea, however, right now they serve soft drinks only. The set lunch comes with a bowl of soup which we can self-service from the counter and a pudding dessert. They have improved their mushroom soup’s quality with additional mushrooms inside the soup. Last time, we always think it their mushroom soup is made directly from the canned soup. At least for now, it made some effort to make the soup better. My main course for the day is the pan-fried salmon in teriyaki sauce with mashed potatoes and salad with Japanese dressing. It looked pretty well presented. 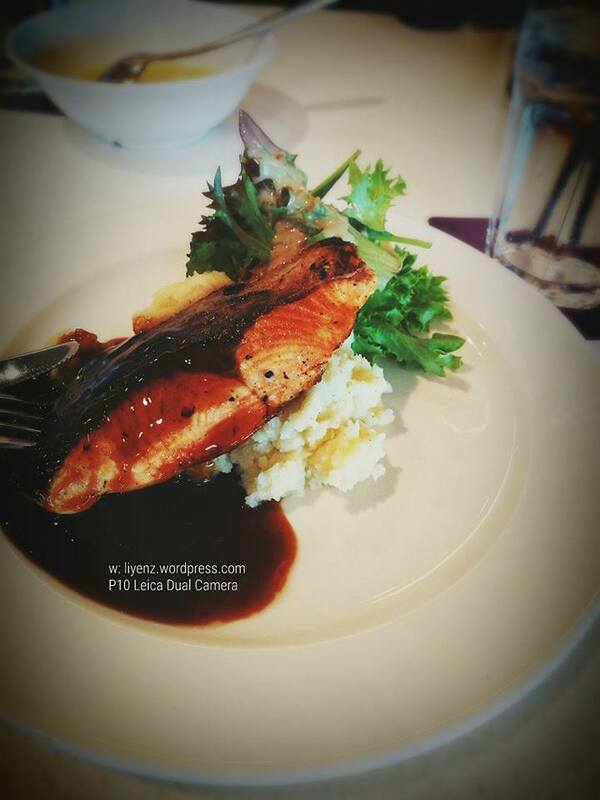 The salmon itself is well-tasted, not over-cooked and if you want extra taste, teriyaki sauce goes well too. By the way, today is Valentines’ day. Wishing everyone has a great evening on this special day!